Don’t lose. That’s the message in the WAFL. Last week Claremont took a place in the five, this week they dropped right out again after Peel came from behind at the Showgrounds to score a vital victory. The Thunder now look set for their first finals campaign. Clancee Pearce reacted to his omission from the Fremantle team with a stunning display for Peel and Josh Bootsma and Ed Langdon continued their good form along with Jacob Ballard and Connor Blakely. Zac Clarke was a game breaker with two last quarter goals. Kepler Bradley kicked four goals for the Tigers, Mark Seaby was the game’s best ruckman and Francis Watson was again impressive. Peel’s Jacob Ballard has maintained excellent form. East Perth kept their hopes alive with a 20-point win over Perth after trailing by 13 points at the last break. Jarrad Oakley-Nicholls kicked three goals and Garry Moss, Craig Wulff and Kyle Anderson (two goals) also played well for the Royals. Liam McKenna and Aidan Tropiano were again outstanding for the Demons and youngster Marshall Jones kicked three goals. Swan Districts scored a vital win over West Perth at Bassendean in a game that was in the balance until the last moment. Ryan Davis was the best Swan, defender Tony Notte had another good game and Rudy Riddoch kicked three goals. Marcus Adams and Nic Rodda almost dragged the Falcons over the line. In the Sunday Fremantle derby South Fremantle became the fourth team of the round to trail at three quarter and go on to win and just about put an end to East Fremantle’s season. Callum Ah Chee made a remarkable league debut for the Bulldogs and kicked three goals, Ashton Hams had another big game and Josh Pullman kicked three goals. Brock O’Brien kicked four goals for the Sharks. The ladder: Subiaco 48; West Perth 36; Peel 36; Swan Districts 32; South Fremantle 32; Claremont 28; East Perth 28; East Fremantle 20; Perth 4. 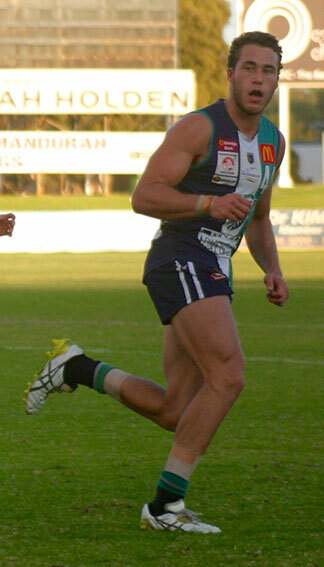 This entry was posted in Footy and tagged Jacob Ballard, Peel Thunder, WAFL. Bookmark the permalink.